Derbyshire Fire & Rescue Service has said tonight that it is currently involved in providing on-going support to areas of the country currently affected by severe flooding. In January, the Service deployed equipment, including a high volume pump (HVP), to Devon & Somerset Fire and Rescue Service, to assist them with the pumping of flood water that has been affecting the region for several weeks. On Tuesday 11th February, a specialist water rescue team was deployed from the Service to assist Royal Berkshire Fire and Rescue Service with the emergency response to flooding in the Upper Thames area of the county. 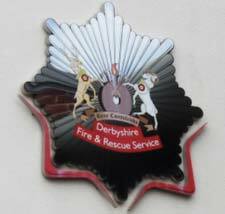 Derbyshire Fire & Rescue Service, Response Group Manager David Hutchinson said: "The assistance Derbyshire is providing to other Fire and Rescue Services comes under nationally agreed mutual aid protocols that are in place to provide additional support at larger national incidents. "Derbyshire Fire & Rescue Service recognises the challenges being faced by our emergency service colleagues in the South of England, alongside the distress and anguish being caused to residents of affected areas. We are therefore keen to join the emergency response teams working in those areas, providing assistance and expertise to help alleviate the pressure on all concerned."